The natural fire in California on Saturday became close to being the third largest fire in the history of the state, reports Reuters. Even more destruction is possible because of the return of the severe winds that feed the deadly fire. The so-called Thomas fire destroyed more than 1,000 buildings, including some 750 homes, in coastal communities in Southern California since the start of December 4, the California Department of Forestry and Fire Protection reported. A total of $ 97 million was spent on fighting the fire with an area of ​​103.6 thousand hectares. Thousands of firefighters eliminate fire round the clock, helicopters and planes drop inhibitors into flames. 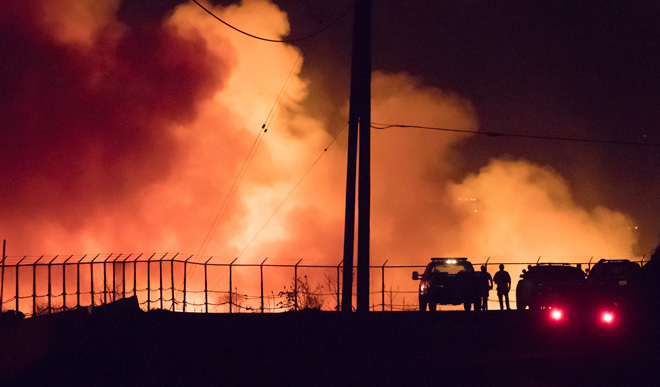 The vast area burnt by fire is only 161 km northwest of the Los Angeles business center and is approaching the size of the “Rome” fire in 2013 (104.1 thousand hectares). The “Rome” fire was the third largest in the history of the state. Fire “Thomas” is located only 35% and threatens 18 thousand buildings. The combustion “devours” tall grass and shrubs, spreading along the picturesque Pacific coast. The hot wind that helped the fire to grow will remain strong until Saturday evening in the mountains of Santa Barbara County, warned the National Weather Service. Gusts are expected to reach speeds of up to 64 km / h.
From Saturday night to Sunday evening, winds can be observed in the nearby Ventura district. Here, the fire “Thomas” originated for unknown reasons, and here it still burns. Firefighter Cory Iverson, 32, was killed on Thursday, while extinguishing a fire near the village of Fillmore in Ventura County. The Thomas Fire is one of the major fires that have erupted in Southern California this month, although all others are localized. Because of fires many schools are closed, roads are blocked and hundreds of thousands of people are evacuated. Also, fires are responsible for low air quality throughout Southern California.